The 24 Hours of Lemons Forums → Other Random Car Stuff → Supercharged Studebaker? So I found this dirt cheap, rusted and damaged 1956 Studebaker President on Craigslist in town, and am thinking that it might not be a terrible car for entering in Lemons. 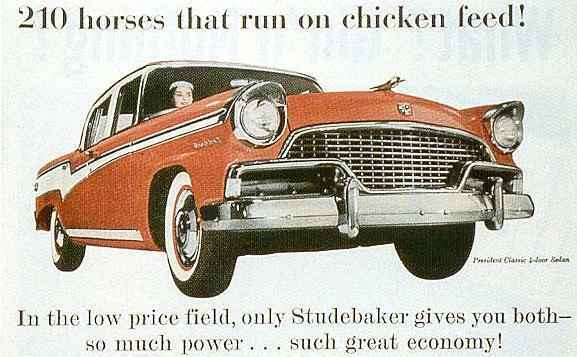 Read somewhere that nobody has built a supercharged Studebaker yet, so does anyone think this would be worth trying? Racing cars is for rookies. Racing crapcans takes balls. I for one think it's worth trying. Because if you do happen to pull off 2 consecutive days of racing w/said vehicle, an IOE win is almost guaranteed. Use an R-2 289 Paxton supercharged V-8 from an Avanti or a Hawk. Ponder this.....3 N.A. Studebakers have entered Lemons races and all 3 have been awarded the highest honor. I.O.E. You could surely make that a perfect 4 for 4. No other automobile manufacturer will ever come close to that. Become a member of the Studebaker I.O.E society. Build that car. I hesitate to say this, in that I want to see more Studebakers in Lemons, but Humber is also in the running at two for two. I want to see more Humbers in Lemons as well. To answer the original question: Yes, a supercharged '56 Studebaker President is well worth trying. Bonus points if you get it to run on actual chicken feed. That's outstanding. Supercharging that for Lemons would be wonderful. Just bringing it to Lemons without a supercharger would also be wonderful. Please, whatever you do, don't paint it.